Jousts and tournaments took the form of individual combat between armored knights, mounted or on foot, using lances, swords, axes and maces. Jousting was first practiced in the early Middle Ages. During these colorful public events, two knights fought to enhance their martial reputation. 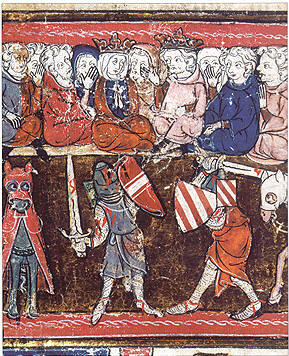 The melee, a tournament (or tourney), provided the audience with the spectacle of many knights involved in mass trials by combat. Compared with warfare proper, this form of organized “entertainment” was only one step away from the real thing. The first written record of a formulated set of tournament rules is usually credited to a Frenchman, Geoffroi de Purelli, in 1066. Unfortunately, his guidelines were of limited use to him as he was killed at the very tournament for which he had composed the rules. Despite this early setback, the popularity of jousting was firmly established in western Europe by the 13th century and it continued as a public sport well into the 1600s. RIGHT: A knight with jousting lance, c.1500. His plate armor includes an extra protective layer near his vulnerable left side. Medieval knights were obliged to provide military service to their king, lord or liege on a regular basis. Warfare during this period, although perhaps exciting to a young knight on his first campaign, was, for most of those involved, extremely unpleasant. Living conditions were usually poor and, if the knight was not killed or badly wounded in battle, the combination of disease or hunger would normally carry him away. But there could be an opportunity for redemption amidst this state of wretchedness. By showing valor and courage on the battlefield, he had the opportunity to establish a martial reputation with the consequent possibility of great financial and social rewards from his master, or even the king. On the other hand, equivalent fame and fortune, combined with regular practice in the use of weapons, could also be gained in peacetime and without embarking on a long and possibly fatal campaign of war. This alternative avenue was to be found in the joust and tournament. A joust was a horseback encounter between two knights with lances. The object was to unhorse the opponent. If a combatant struck either rider or horse with his lance, he was automatically disqualified. This was known as “tilting” If the opponent was not unhorsed but a clean hit was made to the centre or “boss” of his shield, points would be awarded. ABOVE: A knight is unhorsed with a jousting lance. 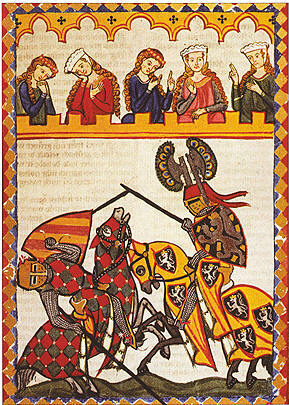 The illustration is taken from the Codex Manesse by Waither von Klingen, Zurich, c.1310—40. Taking the form of massed trials by arms in a public arena, the melee or tourney was a popular part of the tournament in the 12th and 13th centuries (jousting became popular later on). It was a savage and brutal fixture, with many lives lost and serious injuries sustained. Upon hearing the call to charge, rival knights rode or ran onto the tournament field and proceeded to unhorse or attack their designated opponents with a selection of weapons, including broadsword, war axe, club or mace. RIGHT: In this French 14th-century illumination the knight Lancelot is depicted in single combat, watched by King Arthur and Guinevere. In some competitions, the melee was more organized, with combat restricted to a series of three strokes per weapon: for example, three tilts of the lance or three strokes of the sword, and the same for both battle-axe and mace. To actually kill an opponent during a tournament was considered morally wrong, although the ferocity of the combat sometimes inevitably led to fatalities. Jousting lances were made of solid oak and it would have required considerable strength, force and accuracy to unseat an opponent. It would certainly have taken a significant strike to shatter a lance. Knights practiced their technique against a specially constructed target, or quintain, a life-sized re-creation of an opponent’s lance, helmet and shield. In modern-day re-creations of the joust, a lightweight, wooden lance is used in order that it can break more easily and so lessen the impact on an opponent. Two types of horses were used during the joust. Warmblood chargers were selected for their stamina and quickness in the charge, whereas heavy warhorses or coldblood destriers were chosen for their large bulk, which made them deliberately slower but able to pack a heavier punch upon contact. Horses were trained to canter at an ambling pace to give their riders stability and enable them to focus and aim better with their lances. 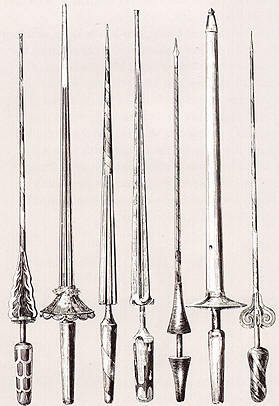 ABOVE: A selection of jousting lances. At the end of each lance was a coronal (crown-shaped metal cap) consisting of three or more metal prongs, designed to catch onto the opponent’s shield.